Like Tone 8, Tone 9 holds the Peak Energy of Transformation. Peak Days are prime for accomplishing whatever we set our minds to. Tone 9 is intent on “completion.” 9 calls for the Patience to look deeper into our own experience. It comes with a warning that there could be suffering if we fail to look beyond their face-value. It’s not a threat of impending consequences, but a way to lift a burden we already bear, and could carry on into the future. We weren’t created to live a lifetime defined by suffering, struggling to overcome our own Human Nature. We were created Human-by-design for a Divine Purpose. Earth/CABAN is the Day Sign of Mother Earth, the Forces of Nature, the Source of Wisdom she holds, and her Movement through Time. 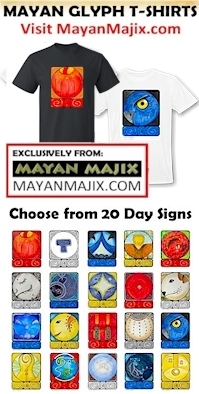 The K’iche Maya call it Noj, the Day Sign of Knowledge. Mother Earth is the Source of everything Human knows. Noj is revered as a Sacred Word, meaning all the capabilities of the Human Mind… our Intellect, Imagination, our Memories and our Consciousness. Noj is Human’s means of Movement with a Divine Meaning and Purpose. Noj is the Force that influences us to behave in ways that exceed our Human Nature. Noj is “Sacred” as the word that defines an “invisible” Force held by Human, a Power to be a “visible” Personification of the Creator. Earth/CABAN is the Source of Jaguar’s magic. The Jaguar attributes Mother Earth as the Source of every Blessing. The Jaguar is the Shape-Shifter and Shaman. The “Earth Magic” held by the Jaguar is “Noj” – the Divine Magic we hold, a Sacred Jaguar Identity that each of us can claim. Through deeper inspection we could see how Human was created to be the shaman, the shape-shifter, holding the power of a “Visible” Transformation. When we follow the guidance of our Spiritual Gifts, we shape-shift into a reflection of Divinity. The Movement that Spirit inspires is seen by others as the Presence of God. We become the One that shows up, proving God reached out through another Human Being. Like the Jaguar, we can travel in stealth as mere Human, leaving footprints behind that lead to the Holy Places and Sacred Temples. There, in the time and place of Divine Consciousness, we shape-shift to Divinity through the Atonement of an Offering. The Creator is made “visible” whenever we do something contrary to our Human Nature. We draw the light of the Creator into the world. We wouldn’t be able to do that if we were wholly a Spiritual Being. The Light we would shine could be mistaken as our own. In our identity as Human, our Light will be reflected as something Above our Self. Our Human Nature makes it possible for the One Divine Consciousness to be Seen. We no longer have to suffer that we are Human. We are forgiven for a sin we never committed, as a failing of our Human Nature – a Nature necessary for the Creator’s Light to shine. We are Sacred to the Creator for bearing identity of our Lower Nature to serve as a vessel for the Divine. Living as Human on Mother Earth, we Know there is something we can’t see. The mysteries beyond Human understanding, reveal there is more going on than meets the eye. From the realm of Spirit, we discover the unseen Forces of Spirit. The more we choose to live in Spirit, the more real our Heavenly world becomes. We leave footprints from every visit that make it easier to find again when we Remember. CABAN gives us a Divine Reason to live as Human in the world. The Cherokee Day Sign, the Heron, lives a life of perpetual migration… Movement that Supports Life. Our Movement inspired by Spirit supports our Spirit Life. The Heron is related to the Phoenix, born again to rise from its own ashes. We rise from the ashes of our Human Nature by following the leading of Spirit. The Aztec call it Ollin, a Day Sign simply meaning Movement. The Aztec define this as a “good day” for the “active principle” and an “unlucky day” for the “passive principle.” This is an important day to Act on Divine Inspiration, to witness a shape-shift into the Divine. As a vessel of the Divine, we do things contrary to our Human identity. We make Spirit Visible in the world through our Offerings. Yesterday was a High Experience of Spirit. Offering the mundane experience of living as an Offering, I saw Divine Spirit working through me. Returning home, I fell back into my Human forgetfulness. I saw the Truth that my “moments” of Divinity were contrary to my Human nature. We can be Transformed by a Truth that in our Worldly Nature, we were designed for a Divine Purpose. Our Human lives can be transformed when we recognize the Miracle of being made Human. Our Humanity is the filter that proves the existence of a Divine Power. To all my relations, may we remember we exist as Human under the Wing of the Almighty. May we see how we are worthy of Unconditional Love by bearing our Human identity. May we make an Offering to Mother Earth for all she makes possible as a place of matter and movement. May we cherish our resemblance as her children, sharing the same Unseen Forces of Nature. May we see our Primary Identity as the Jaguar capable to shape-shift from Darkness to Light. May we claim our life as Human in the world as a “second reality” through which we can make the Invisible, Visible through a shape-shift to our Divine Nature. TZOLK’IN SYNCHRONICITY: This morning I looked back to the post written on the last 9 Earth/CABAN, May 26, 2017. Yesterday, exactly one 260-day round to the day of 8 Wisdom/CIB, I realized another major milestone on my sacred journey. I’m sharing a the “21-Days of Gratitude” as a perpetual Personal Ceremony through the next journey to 8 Monkey/CHUEN Maya New Year. The “21 days” begin and end on Jaguar/IX. We can see where the Jaguar’s Gratitude could lead us. I’m grateful that it’s Divine to be Broken. I’m grateful for a Human calendar in correspondence with Mother Earth that reveals a Divine Time for every Spiritual Purpose. What can you Love today?